Team Ico is getting really good at not telling us anything about The Last Guardian. Team Ico's third project, The Last Guardian, is a confirmed no-show for the upcoming Tokyo Game Show, which takes place later this month. 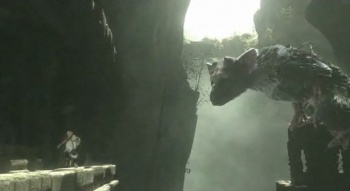 The Last Guardian is an action adventure/puzzle game in which a young boy teams up with a baby griffin called Trico to escape a ruined castle. TGS will not be the first major videogame show that The Last Guardian has been conspicuously absent from - the game was not at this year's E3 either. Sony admitted last month that work on the game wasn't going as quickly as it hoped, and that while Team Ico was making progress, it wasn't the kind of progress you could really show to people very easily. As you might have guessed, there's no firm release date for The Last Guardian. It was originally scheduled for the end of this year, but in April Sony pushed it back to 2012. Considering how compelling Team Ico's previous output has been, it's almost certainly going to be worth the wait. Of course, knowing that almost makes the waiting worse.